Original German type pizza from Elsass. 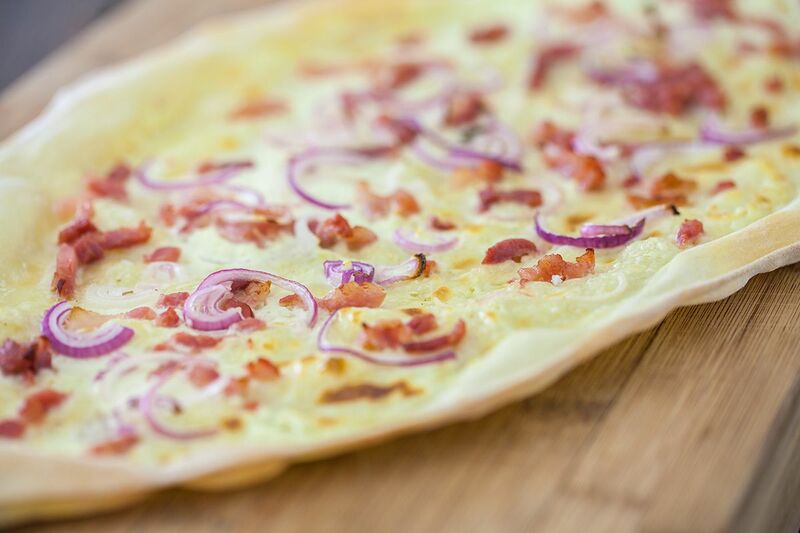 The thin crust of this flammkuchen pizza will make you crave for more! Great for parties. MIX in a large bowl the lukewarm water with 7 grams of yeast. Stir well and let stand for about 5 minutes. 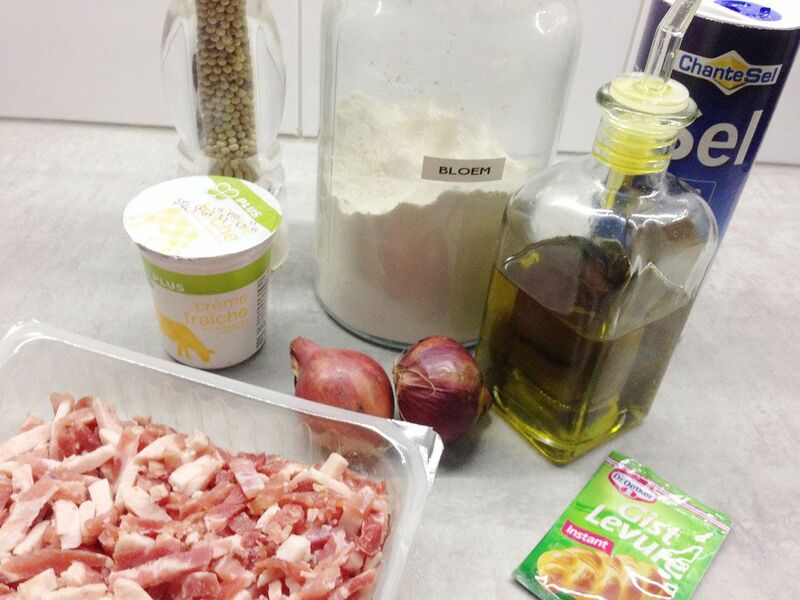 ADD the flour to the yeast mixture with a pinch of salt and olive oil. MIX together using your standmixer. You can mix by hand if you don’t have a standmixer, but this requires more effort. MIX for about 5 to 10 minutes until a dough forms. Drizzle some olive oil into another bowl, then place the dough into it. Cover with a damp towel and let the dough rise for about 1.5 hours. PRE-HEAT your oven to 250 degrees celsius or 482 degrees fahrenheit. 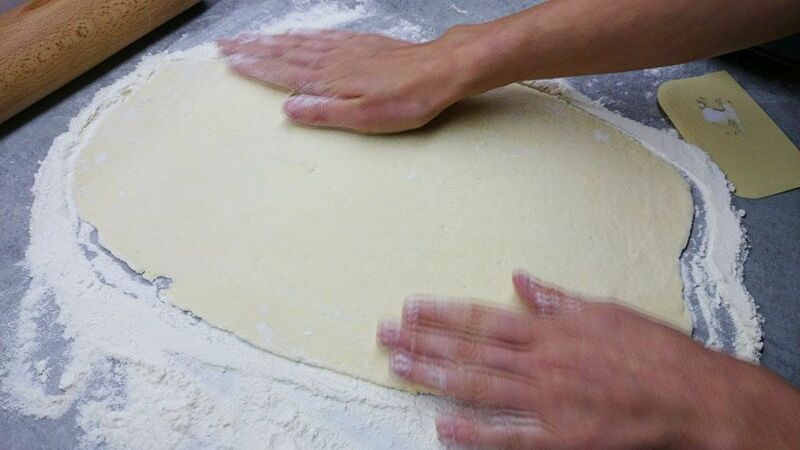 GRAB the dough from the bowl and roll out until the dough is very, very thin. Thickness should not exceed 2 millimeter. You can make about 2 large flammkuchen from this dough. PLACE the dough on a sheet of greaseproof paper. You can now add the topping. Spread crème fraîche over the dough, but make sure to don’t smear anything on the edges. The edges tend to curl up when baked, so toppings can burn more easily. SLICE the red onion into half rings, or dice it. Whichever you prefer. 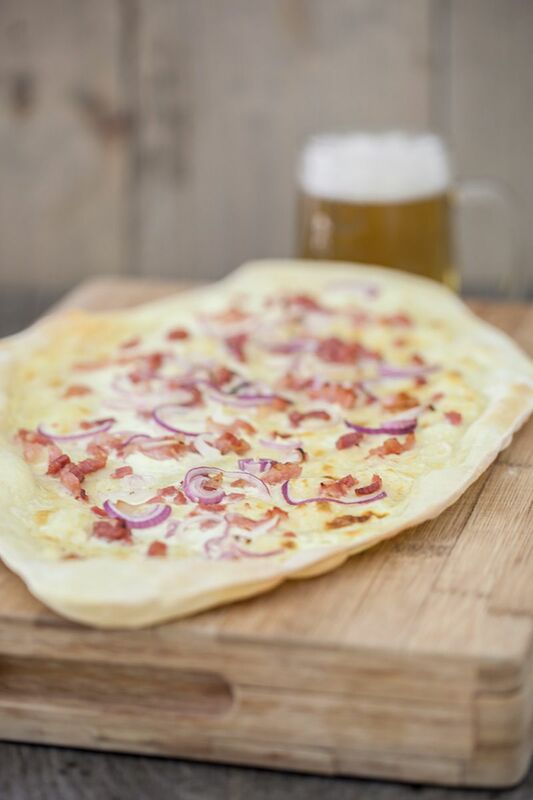 Divide the diced bacon (or strips) over the two flammkuchen. Add salt and pepper to preference. BAKE the flammkuchen for about 8 minutes in the oven, or until the pizza bottom lightly brown. I adore how thin and crisp this pizza looks! Yummy! Excellent recipe. We enjoy these so much in Germany–and now at home in Texas. Thanks Shirley! So crunchy and thin, mmm! Every time I went to Saarbrueken (sp) I used to get this from a street vendor. This town was French and then German at some point. 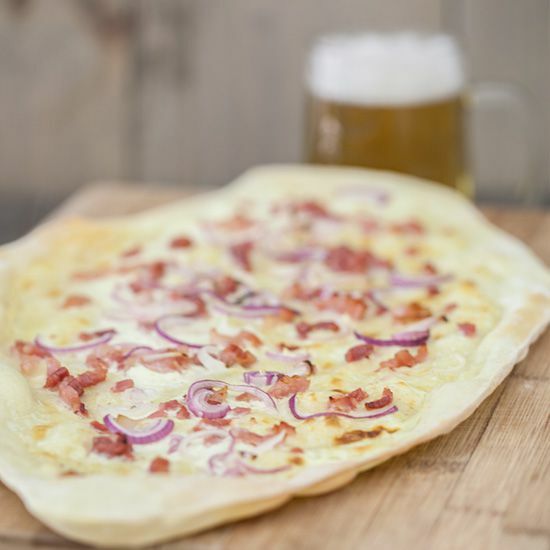 Flammkuchen is so good! I remember being in the Alsace region and having it from an outdoor fire oven. I have wanted a recipe.